Whether you’re in the middle of an event or on the road, there are tools to help you schedule Instagram posts. In this article I’ll share four tools you can use to schedule Instagram posts. Instagram was designed primarily as a mobile tool, so that’s where most interactions take place. Instagram wants users to capture events as they happen. While real-time posting is the best-case scenario, creating and publishing a complete post on-the-go doesn’t work for everyone at all times. If you’re using the native version of Instagram on a desktop, you can view Instagram content and interact with people you’re following, but you can’t upload anything. 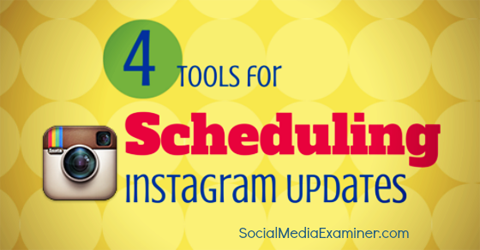 four tools you can use to schedule Instagram posts. Remember, scheduling or automating posts to your Instagram channel should not be the primary way you keep your Instagram channel updated. It should be part of your company’s Instagram strategy for those times when you know you’ll be unavailable. Let’s take a look at the tools below, and see how to schedule Instagram posts. Schedugram will let you upload single photos, multiple photos and videos. Once you upload, edit your photos. Tools available include cropping, retouching, adding effects and enhancing your images. 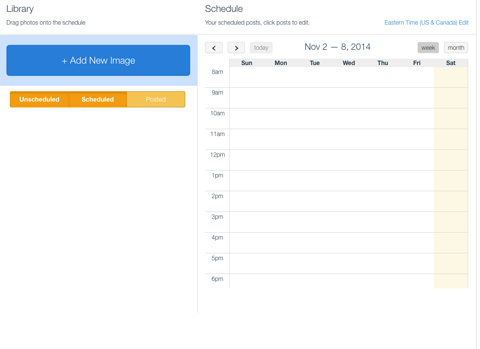 View of the photo editor in ScheduGram. When your photos or videos are ready for Instagram, schedule them and request notification via email once they’ve gone out. Click the option to be notified when your updates post. Manage multiple Instagram accounts and give access to as many users as you need. Cost: Various packages available, which start at $13 per month with a 7-day free trial. Use Later (formerly Latergramme) to schedule posts from a browser or use the mobile iOS app. 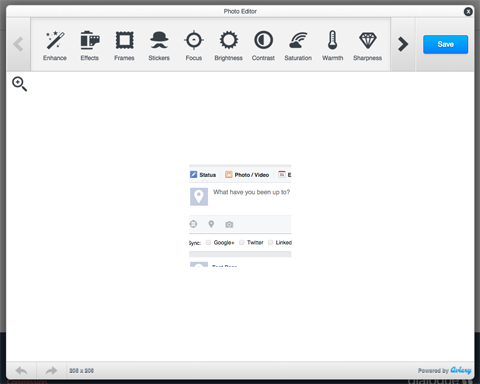 A couple of things to note: With this tool, you can only upload individual images. Plus, while you can schedule and organize your Instagram posts, Latergramme does not post them for you. 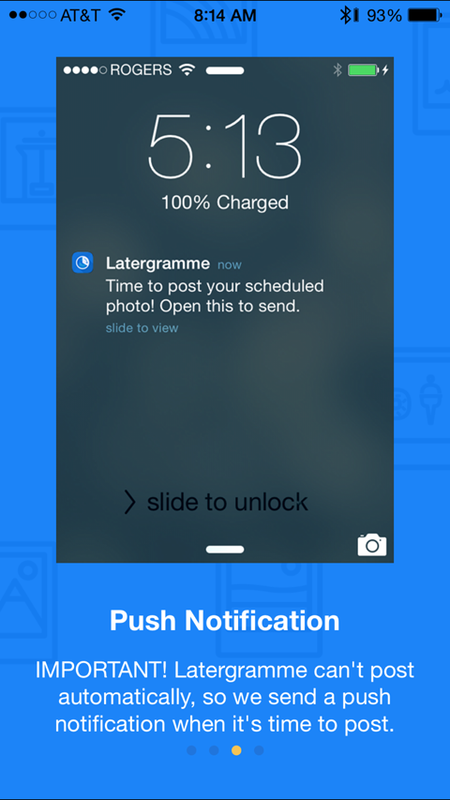 Schedule and organize Instagram posts with Latergramme. Later sends a reminder at the scheduled time, which you can open and post via Instagram. Latergramme sends a message when it’s time to post. 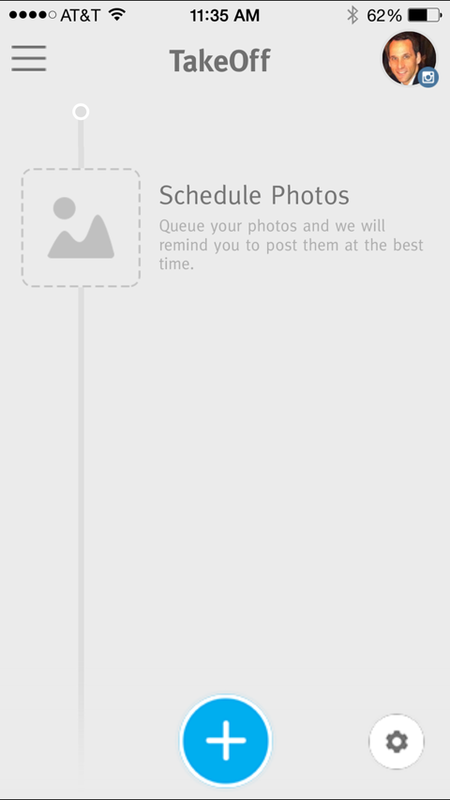 Later is kind of like a glorified editorial calendar for Instagram, since you still need to post the photos yourself. Cost: Free. Paid accounts start at $9. With Onlypult (formerly Instapult), you can manage multiple Instagram accounts and invite other administrators to post, as well as upload single or multiple images on this web-based tool. 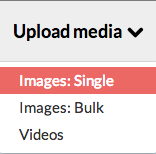 Upload single or multiple images using Onlypult. 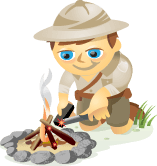 Onlypult also gives you the ability to edit your images and apply filters. Once you add the image, schedule it to post. Use Onlypult to schedule images to post to Instagram. The web functionality makes it easy to delete scheduled updates. Cost: Free to sign up and get a weeklong trial. Four premium packages available, starting at $12 per month. Part of the JustUnfollow app, TakeOff is similar to Latergramme with a few exceptions. For one thing, TakeOff has both an Android and iOS mobile app. Plus, you can only schedule images; they don’t actually post them for you. This is because of the way Instagram allows companies to access their API. TakeOff offers hashtag suggestions and a recommended time to post when your followers are most engaged. 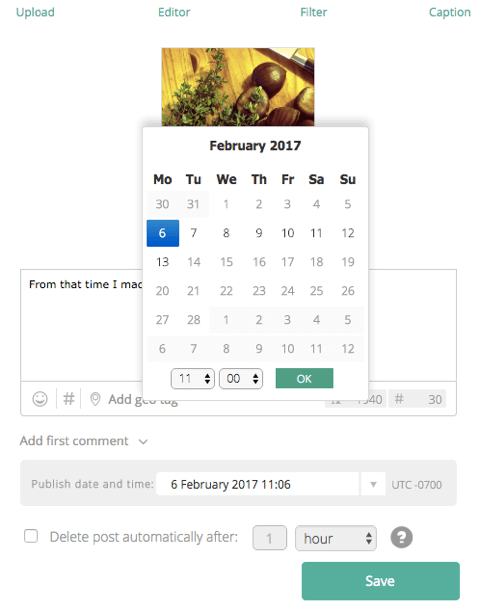 TakeOff allows you to schedule posts. It will then remind you when to post them to Instagram. One important difference: TakeOff doesn’t apply filters and effects within their app. Instead, when you schedule a photo to go out, it reminds you and then gives you the option to open it in Instagram or another editor to apply any additional filters. The interface for TakeOff is easy to use. Also, you can manage multiple Instagram accounts and team members. Cost: Free, with premium options $9.99 and up. Here are some instances when it is appropriate to schedule Instagram content ahead of time. Conferences: If you’re attending or running a conference, schedule out a few updates to post during the conference, such as Instagram videos that pertain to certain sessions. Record special messages to your fans to tell them what you’re doing and that you will share more information afterwards. Travel: Will you be on an airplane without WiFi or traveling to a location that doesn’t have the best Internet connection? Record videos or share photos of some of the places at your destination. To get your followers involved, share the location and ask for recommendations in the comments. When you get to a reliable connection, respond to your audience. Large Blocks of Down Time: If you know you’re taking a break from your Instagram audience for a few hours (at the gym, a doctor’s appointment or meeting), don’t leave your audience hanging. Schedule a few updates so you can continue to add value for your followers. For example, create tips or positive affirmations in the form of quotes with images or short videos. Then schedule them on Instagram. Content Promotion: Pull out snippets from your blog posts to use in an Instagram update. (Create this similarly to the quote posts mentioned above.) This is akin to a drip campaign, but done through Instagram. The goal is to provide a valuable piece of information for your audience and to drive them back to your website to read the full article. When deciding what to use to schedule Instagram content, think about which tool will help you get the job done right. If you’re glued to your mobile device 24/7, you might prefer a tool that schedules, but doesn’t post your updates for you. If you’re always on the go and want the convenience of having some of your updates automatically post for you, you might prefer another option. Remember, Instagram is supposed to be used “in the moment,” so don’t schedule everything. The people who follow you don’t expect you to be on Instagram all the time, but they do expect you to have a consistent posting schedule. What do you think? When do you schedule Instagram posts? What Instagram tools do you use? Please share your recommendations in the comments.